The custom virtual tour library. In the demo you can select a sample form under the 'Try ME' navigation. There are two buttons on the right hand side. One demos the virtual tour of setting up a new user account, and one demos a tour of the current page. Give it a try! Built on bootstrap 2.1.1 but supports up to 2.3.1. To upgrade you need to replace the bootstrap less folder with your desired bootstrap version. Find yourself a good less compiler and recompile the less into CSS. You have to setup NPM by download Node.js that NPM will come with Node.js already. In the Gruntfile.js file, you can make some configuration. There are two example tasks here. First : Basic Complie LESS task. Second : Task Watch for Compile LESS automatically when you edit some of your LESS files. Note : To exit watch, you have to press Ctrl+C 2 times. The source contains all the less files needed to compile a custom instance of the less template. Just point your less compiler to the file in bootstrap-clean-dashboard-theme/less/customize-template.less and recompile your CSS. There is a default theme which can be overridden with different styling. 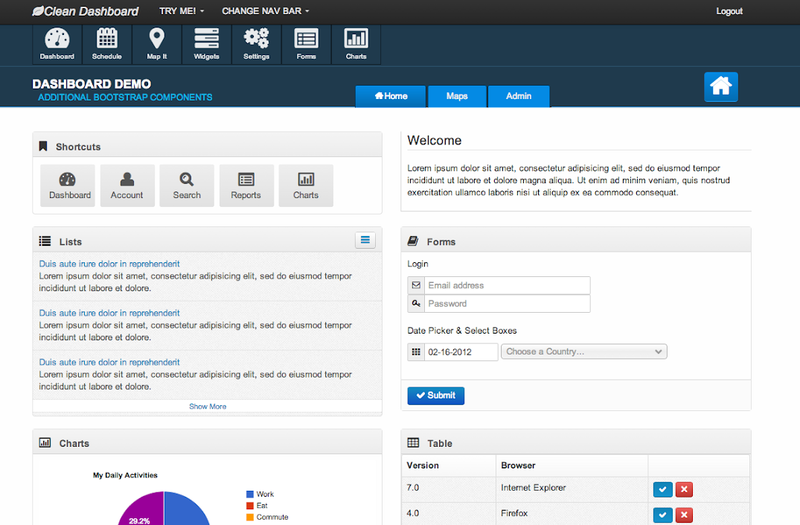 The theme has a demo in the repository under clean-dashboard/demo. To view the demo theme pull down the repo and start an http server in that directory. I like to use SimpleHTTPServer app for Mac. Project contributions must come from the community. The author is no longer actively working on this project... Fork if you want to improve and contribute. It will be appreciated.